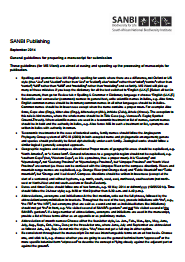 All manuscripts and text files submitted for publication by SANBI Graphics & Editing shall be reviewed, edited and proofread as needed and according to SANBI Graphics & Editing house style. Below is a document with general guidelines for authors who are busy preparing manuscripts. For Flowering Plants of Africa manuscripts, please contact the editor for journal-specific guidelines.